Can we reach 2 million classifications? Radio Galaxy Zoo is halfway through its fourth year. We are going through all the classifications and finalizing our 1st data release. We could not have gotten this far without all of you. From the bottom of our hearts, we THANK YOU. We have reached 71% completeness and sit just over 1,959,000 classifications. Can we reach 2 million? As we did with our 1 million classification milestone, we invite you to classify our 2 million-th Radio Galaxy Zoo supermassive black hole. We have been working hard on Radio Galaxy Zoo merchandise (mugs, holographic bookmarks, and stickers). These are up for grabs for those who classify near or on number 2 million. As always, make a note (click on discuss) if you have found something interesting, confusing, or if you have a question. 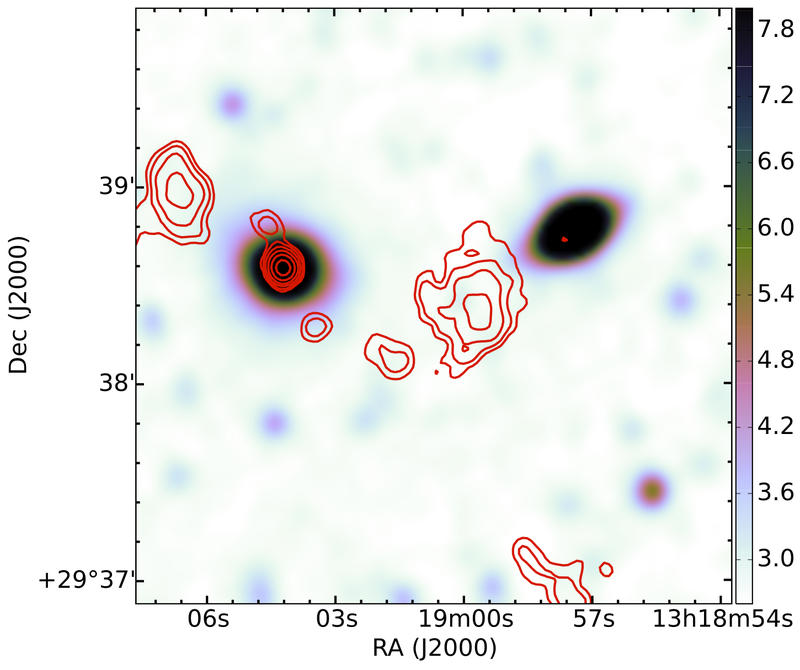 Start your hunt for active supermassive black holes at Radio Galaxy Zoo. One of our scientists Prof. Ray Norris put the call out to the Radio Galaxy Zoo community for a hunt on spiral galaxies hosting powerful radio sources. The first known galaxy of this type is 0313-192, a galaxy much like our Milky Way and has left astronomers baffled. Figure 1: 0313-192 The wrong galaxy from the Astronomy Picture of the Day. Credit: W. Keel (U. Alabama), M. Ledlow (Gemini Obs), F. Owen (NRAO, AUI, NSF, NASA. Keep an eye out for any hourglass sources that seem to be hosted by galaxies that look spiral in the infrared. 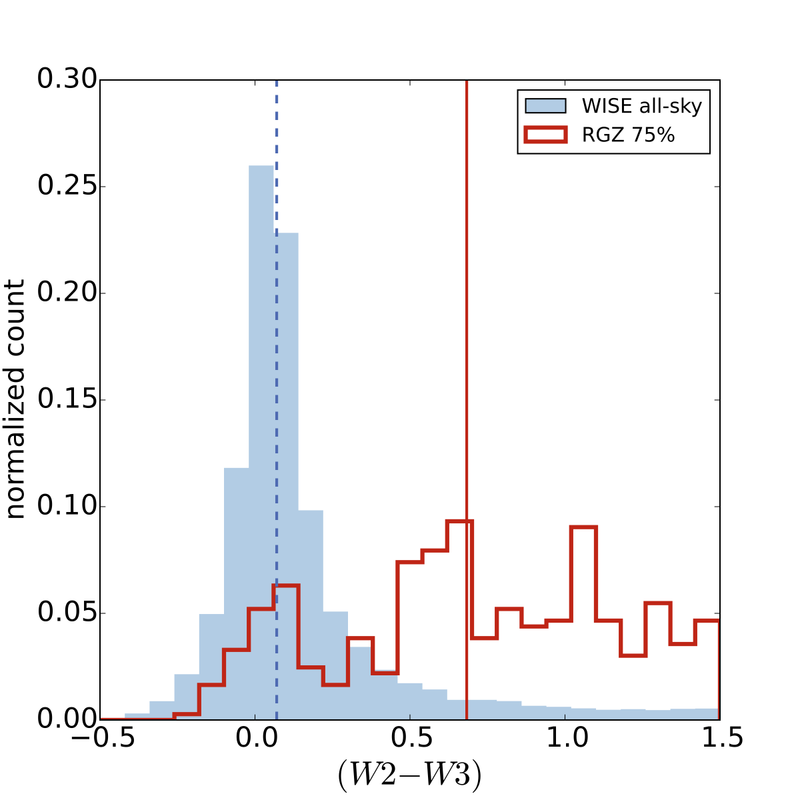 These objects are incredibly rare in the local Universe (only 2 or 3 known) and we may not see any in Radio Galaxy Zoo, but if someone does find one, that would be worth writing a paper about (with the discoverer as co-author, of course). The rarity of radio-loud spirals is thought to be because the radio jets heat up and disrupt the gas in the spiral, switching off star formation, and turning the galaxy into a “red dead” elliptical. But we might find one or two where the jets have only just switched on and haven’t yet destroyed the spiral. See The radio core of the Ultraluminous Infrared Galaxy F00183-7111: watching the birth of a quasar for another example of this process in its very early stage. So keep your eyes peeled and yell out (very loudly) if you find one! We are pleased to announce that the Radio Galaxy Zoo community has identified over a dozen potential candidates and we are in the process of following these up. Have you seen any? 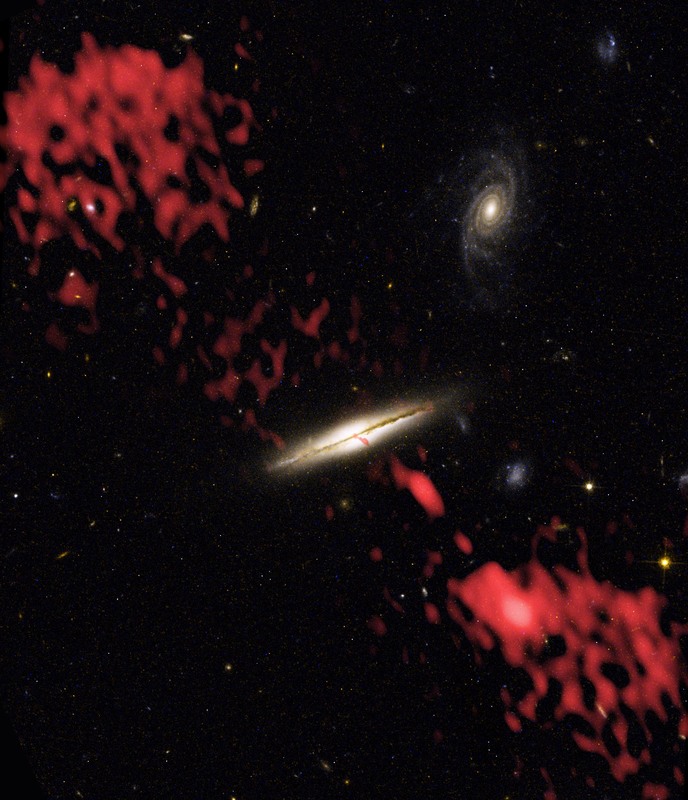 Head over to Radio Galaxy Zoo to join in on the hunt and let us know what you find.